In a small town just outside of Fort Worth, Texas in 1995, Tessa “Tessie” Cartwright, sixteen, was abducted by a man who already had taken three other young women. Tessie, a national hurdling champion and runner with an abnormally low heartbeat, survived her internment, but the other three girls did not. She was found and saved after a farmer’s dog alerted his master of the grave site. The girls were given the macabre nickname “the Black-Eyed Susans” because the killer buried the girls and then planted the wildflowers over their shallow graves. Terrell Darcy Goodwin, a black man, was arrested, even though all that linked him to the crimes was a muddy jacket found a mile away with his blood type on the right cuff. This psychiatrist helped Tessie prepare for Terrell’s trial. Her mind blocked most of her memories of the abduction. Still, her appearance on the stand at Terrell’s trial was crucial to the jury’s guilty verdict. Terrell Darcy Goodwin was convicted of the murders and has sat for nearly two decades on Death Row in Huntsville awaiting his execution. In the present Tessie is called “Tessa.” She’s in her mid-thirties and lives in Fort Worth with her daughter Charlie, age fourteen. Tessa has Post-Traumatic Stress Disorder, as well as survivor’s guilt. Like so many trauma victims, she doubts herself, and mistrusts her own senses. Tessa has built her life on normality, anonymity and routine. Six years ago she was contacted by an attorney named Angie Rothschild. Angie believed that Terrell was innocent of the murders, and was relentless in her efforts to convince Tessa. When Angie dies suddenly from a heart attack, the appeal process is taken over by attorney William “Bill” James Hastings III and Dr. Joanna “Jo” Seger, a forensic scientist. Tessa wants to help with the appeal. She has another reason to doubt Terrell’s guilt. Although it is February, someone has planted a patch of Black-Eyed Susans, a summer bloom, just outside Tessa’s bedroom window. While many novels are classified as “psychological thrillers,” Black-Eyed Susans actually is because Julia Heaberlin places the focus on the mental state of all the characters. The retrieval of memory is the key to unlocking the murderer’s identity. The novel is told through alternating first-person narratives between Tessie in 1995 and Tessa in the present. Heaberlin includes a lot of fascinating, authentic forensic science, particularly that of mitochondrial DNA. Jo wants to identify the bodies, as more bones are discovered, in order to closure to families of the missing girls. I think Dr. Jo Seger deserves her own book!) Tessa wants "the Susans" to be at peace finally too. The narrative moves at a rapid pace, and the dialogue sounds genuine. Julia Heaberlin’s writing is so gorgeous and poetic that the reader will want to read this novel slowly. Texas is not just the setting, but a character in the book. The book handles two very serious subjects with objectivity and sensitivity: people who are trauma survivors, and the death penalty. Heaberlin has a firm hand on the plot, but has a delicacy for dealing with the characters’ mental states. Tessa may seem fragile at times, but this protagonist perseveres. 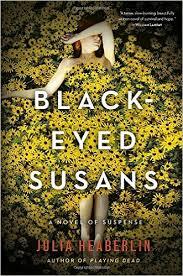 Black-Eyed Susans is a rich, remarkable and intense psychological thriller and suspense novel. Thank you to Ballantine/Penguin Random House for loaning me a digital copy of the novel through NetGalley.